Many readers will instantly recognize the Quad marquee and associate it with the British manufacturer of electrostatic and dynamic speakers, as well as a line of tubed electronics. Many of those same readers will also recognize the name Chris Johnson and associate it with the Canadian manufacturer, Sonic Frontiers, as well as the Parts ConneXion factory. But combine Canadian Parts ConneXion with British Quad and it necessarily follows that the preamp under review is available exclusively through Walter Liederman's Georgia-based Underwood HiFi, a formal Quad dealer who ships stock units to Montreal for the upgrade package designed in collaboration with Mr. Johnson. Right? Yes, it does follow by necessity, this exclusive arrangement. You want this particular modification? Liederman is your -- only -- man. 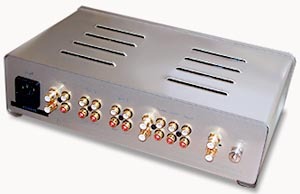 The Quad QC-Twenty Four preamp starts life as a modest yet nicely finished piece, measuring just short of 12 inches wide, standing 3½ inches tall and going about 8¾ inches deep (including rear connectors). 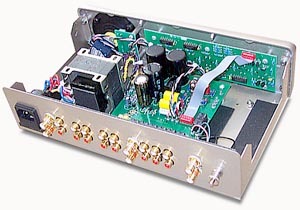 Despite its modest dimensions, the Twenty-Four is a full-featured preamplifier sporting five line-level inputs (one marked 'phono' though there is no internal phono stage - and don't look for one coming soon either), two buffered tape loops and twin pairs of outputs to facilitate subwoofing or biamping; a nice touch. An IEC power inlet and a ground connection finish out the rear accoutrements. The front panel features a large round volume control, the push-button power switch and the seven input selectors, each accompanied by an LED that turns golden amber when selected. Directly beneath the volume control is a sliding switch to control left/right balance. It has a center detent but is otherwise continuously variable and said to alter balance offset by up to 6 dB. Inside, the QC-Twenty Four is claimed to use a "radically new and functionally simple audio circuit and features relay input switching to preserve signal purity". 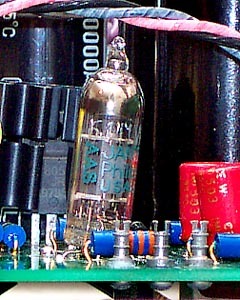 Tube complement is a single tiny 6111WA twin triode said to have a life of 60,000 hours. Quad specifies a frequency response of 5 Hz-50 Hz (+0 dB/-0.5 dB), hum and noise >80dB and recommends a minimum load of 50KOhms. For their trouble, Liederman claims numerous sonic improvements for the unit, including being quieter and allowing for blacker silences, with better low level detail and three-dimensionality; being smoother and more detailed, with enhanced dynamics; exhibiting a more liquid midrange and more even tonal balance over the stock machine; as well as a better-defined soundstage. They also claim better bass extension and impact with more weight and authority. The price tag for all this added goodness? If you already own the QC-Twenty Four, you can have it modified for $600 USD plus freight - or you can buy a new, already modified preamp for $1390 - an increase of only $390 over that of the QC-Twenty Four's stock retail. 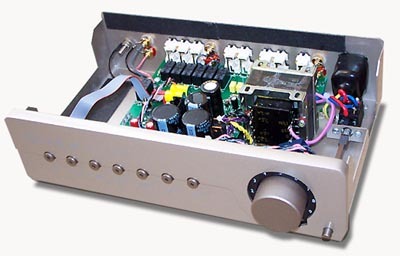 The modded preamplifier carries a 90-day parts and labor warranty. The Quad QC Twenty Four is an impressively solid if unimposing piece. Its compact dimensions strongly suggest use in less conspicuous second systems though its sonics don't. Admirably sturdy with its solid SoundCoat-reinforced sheet metal case, its potentiometer has a smoothly resistive quality strongly suggestive of luxury. 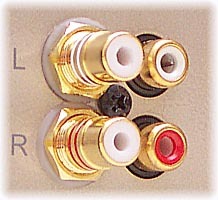 The three pairs of gold-plated Vampire RCA input jacks are a superb touch that users simply won't find in normal pieces in this price range. 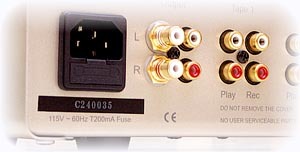 Their employ in the most often-used applications -- CD, pre-out and phono -- indicates assuring signal integrity. Even the enameled metallic finish was a nice change of pace from the ubiquitous brushed aluminum. Buildwise, the balance control was the only aspect of the Twenty-Four that gave me pause. Even in the center detent position (where it is said to be out of the signal path), it maintained considerable play of its slider. Once -- and only once -- did I sit down for a listen to detect that this balance was off by just a bit. Once rectified, this never again became an issue. The only other quibble? The locking WBT RCAs on my interconnects of choice, what with their necessary added girth, could have used a bit more elbow room 'round back - though in the end, even my thick fingers were able to complete all of my connections free of trouble. Refreshingly, both Quad and Liederman eschew braggadocio by not representing the Level-1 QC 24 as a giant-killer (Quad even states as much in their manual). Rather, its raison d'être is to make things just slightly uncomfortable for more expensive products. It's a perfectly reasonable claim because - it ain't perfect. After about 300 hours of break-in had transpired, I settled into the sweet spot for a listen. That's when the Level-1 QC 24 began to reveal that it was no real threat to my thrice-the-price Herron VTSP-1A. Don't get me wrong - there was a lot to like about the sound. What the Level-1 QC 24 accomplishes is much more obvious than what it doesn't. But eventually, I did begin to notice a few things. Intent listening -- and only intent listening -- revealed a slight grain through the mids. And I emphasize the word slight. What we are talking about here is the soft degradation that one would expect, moving from the Herron to any budget-conscious preamp. Conversely, its removal is exactly what one would insist on achieving by moving up, from the Quad to something pricey like the Herron. To be fair to the Level-1, extended listening allowed for easy acclimation and acceptance of the Twenty-Four's other, far more favorable traits. A second area where I thought the Level-1 QC 24 took a back seat? Imaging and soundstaging. The QC was guilty of slightly softening image outlines to where it couldn't quite match the open and airy soundstage of better preamplifiers. Where the Quad QC Twenty-Four Level-1 QC 24 mod disappointed me most? In the area of personality - or more precisely, its lack thereof. It didn't have much of a personality. I know, I know, that's supposed to be a good thing. And for the final user, it's an excellent thing alright. But as a reviewer? If a piece doesn't outshine my reference in most if not all areas, it had better have an easily identifiable personality about itself, to make characterization easy and expedient. Otherwise, the piece must spend an inordinate amount of system time in order to glean both its strengths and foibles. And that delays my own pursuit of audio perfection - not what I got into reviewing for in the first place. So here I sat, day after day listening to the little wallflower that is the Level-1 QC 24. Okay, okay. So the experience wasn't as burdensome as I pretend. Truth is, as I realized that the Level-1 QC 24 wasn't going to unthrone my $4,000 resident champ, I also became aware that it was a very pleasant piece to listen to. For instance, the Level-1 QC 24 is nicely extended at the frequency extremes. Tethering it to the Art Audio Carissa amplifier effected surprisingly little change in the amplifier's basic character or the system's final voicing. Bass remained meaty, extended, tight and powerful. Treble performance was clean and linear, neither forgiving nor overly revealing, really. Through the midrange, the Level-1 QC 24 was more than liquid, resolving and transparent enough to preserve the intrinsic character of the rest of the system. Image outlines may have been a bit soft, but the preamp did an excellent job of conveying both texture and color. Plus, it offered a convincing degree of thereness. The ever-familiar if a bit over-exposed Famous Blue Raincoat by Jennifer Warnes [Private Music 01005-82092-2] is still a personal favorite for reviewing and enjoying. Go ahead, make my day and shoot me. It was also one of the few CDs that placed the Level-1 QC 24 in a less-than-stellar light. Through the Quad, her voice was just a little wispy, with sibilants becoming just a touch too prominent. Not hugely, just a touch. Simultaneously, there remained a crystal-clear window on her voice that imposed no other obvious colorations at all. The opening bass drum whacks on "Bird On A Wire" were just a whisper less taut than I'm used to, but nothing to get excited about. We're talking, I assure you, about the kind of differences observable only on excruciatingly familiar tracks - and remaining both weighty and tuneful, these results would probably sound most attractive on smaller speakers. In particular, the bass-drum whacks heard from off in the distance toward the end of the cut sounded just as they should, with plenty of soundstage depth. On the other end of the sonic spectrum, cymbals and high-hats were crisp, clean and fast. The title track's stand-up bass sounded rich and powerful, Jennifer's voice full and present, with an admirable degree of density of timbre as well as that very high level of transparency that kept reminding me that what the Twenty-Four does well, it does very well indeed. And were it falls short, it misses by little. Check out the saxophone that originates midway back on stage before it blooms in intensity and presence. This track sounded excellent. Obviously the Level-1 QC 24 neither glossed over small problems in the recording nor did it magnify them or create any of its own. It was Two-Fer-Tuesday so I gave Aimee Mann's entire Lost In Space [SuperEgo SE 007] CD two plays in a row. One of my favorite releases of 2002, she obviously didn't disappoint over the Twenty-Four. On the whole, the recording was presented with all the full-bodied flare that I expected both from the CD and my system. Mann's voice sounded unexpectedly refined, smooth and intimate. Unexpected? Yes, I've heard her voice sound a little raw and grainy on some systems, but not that day. The Twenty-Four presented a wall-to-wall soundstage with plenty of depth. In short, the CD sounded first-rate. I hate buying my CDs over the Internet. There's just no substitute for standing in a record store thumbing through the inventory. More than once, when looking for something in particular, I've ordered the wrong on-line CD. Such was the case with Johnny Cash's Silver SACD [Columbia/Legacy CS 86791]. I was looking for his most recent recording and accidentally ordered this 1979 remaster instead. But I'm kinda glad I did. I'm no fan of country music and have only observed Cash's career from afar. I'd never before experienced his voice in my home and on my rig. One listen to "The L&N Don't Stop Here Anymore" and I felt as though I had learned volumes about the man. What a voice! What range! What emotion! What lucidity! No kidding, it was worth the price of the disc. Unfortunately, other parts of the recording weren't so memorable. The brass section sounded as though faked from a 1970's vintage synthesizer, the soundstage was narrow -- though surprisingly well delineated -- and the song lacked the full-bodied character I'd been enjoying all day. No matter: I've enjoyed the song a dozen times since. Talk about the truth, the whole truth and nothing but the truth. The man in black definitely spoke it. The Joe Jackson Band's Volume 4 [RCD 10638] sounded rhythmically driven over the Level-1 QC 24 Quad. I was actually a bit surprised to hear such an excellent sense of beat. Bass lines well known for their propensity to ponder on some systems sounded weighty yet lithe and lively without any thinning. Jackson's voice was clean and as intimately emotive as ever. Percussion was clean and concussive. The Level-1 QC 24 did keep it real though. The soundstage was narrowly cramped and with little depth of field - just as prescribed by this particular recording. Simply put, the Level-1 QC 24 impressed me as a strong performer that only the most demanding listener -- who had better be ready to shell out the long green in said pursuit -- will find fault with. Its greatest strength is its linearity. From top to bottom, the Twenty Four Level-1 Mod is remarkably colorless and transparent. Dynamic and fundamentally honest, it gives you the lion's share of the unadorned truth. 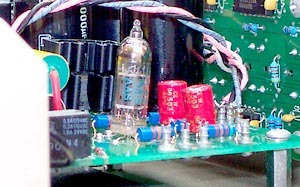 It just won't gussy it up in quite the highly polished manner that more accomplished (read expensive) preamplifiers may. For the listener on a budget looking for musical truth, the Level-1 QC 24 is a great place to start the hunt. I'll bet that plenty of listeners will end it there too. Perhaps those terminals are really an underhanded reminder to get jacked in and hear for yourself?